Annandale’s Nelson’s Nest proves that with simplicity comes the greatest satisfaction. A hole in the wall cafe that spills out into a charming alfresco experience, Nelson’s Nest is a hideaway for Annandale locals. Committing to a coffee fly-by or settling in for a wholesome brunch re-fuel, the community focused cafe celebrates the ordinary with a hint of Inner-West hip. Working with an intimate team of committed staff, brother and sister duo, James and Leanne, double as both owners and floor staff, complimenting Nelson’s Nest family feeling. Set between the never-ending bustle of the Greater Western Highway and surrounding hotbeds of local foodie hangouts, Nelson’s Nest success lies in its subtle determination to keep things casual. Set inside a tight converted warehouse, there mightn’t be enough room for locals to pack into the small indoor area fitted with a kitchen and selection of cosy timber tables. Luckily, Nelson’s Nest encourages eaters and coffee sippers to partake in a street dining experience. Opening in late 2016, Nelson’s Nest have perfected the art of simplicity, giving locals exactly what they want. A hassle free dining experience, served with familiarity and warmth. Both the breakfast and lunch menu are all-day affairs providing delicate but noticeably exciting twists and turns on traditional brunch fare. Following the owners’ recommendations, we trialed an array of Nelson’s Nest favourites (after completing our pretentious coffee order of course). 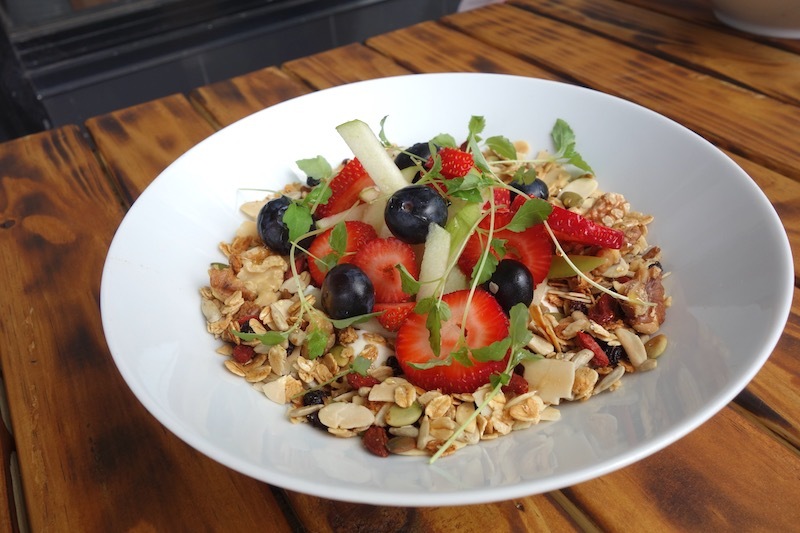 The I Heart Muesli ($13) is just that. An inexpensive, and hearty bowl of house made honey yoghurt and fruit is joyful elevated thanks to a plop of lemon balm and the interesting inclusion of fragrant cardamom. Continuing with another bountiful bowl, the Coconut Tapioca ($16) is a chef’s favourite. Pairing another garnish of house made granola; a jelly bed of coconut and saffron tapioca is dressed with toasted coconut, micro-herbs and a confit vanilla pineapple. The rosewater infused flavouring might be a little too subtle for diners in search of a sweeter taste. Dining out on smashed avo is almost as habitual as adding 50 cents to your coffee order. The Nelson’s Nest rendition of the classic dish reinvents expectations. 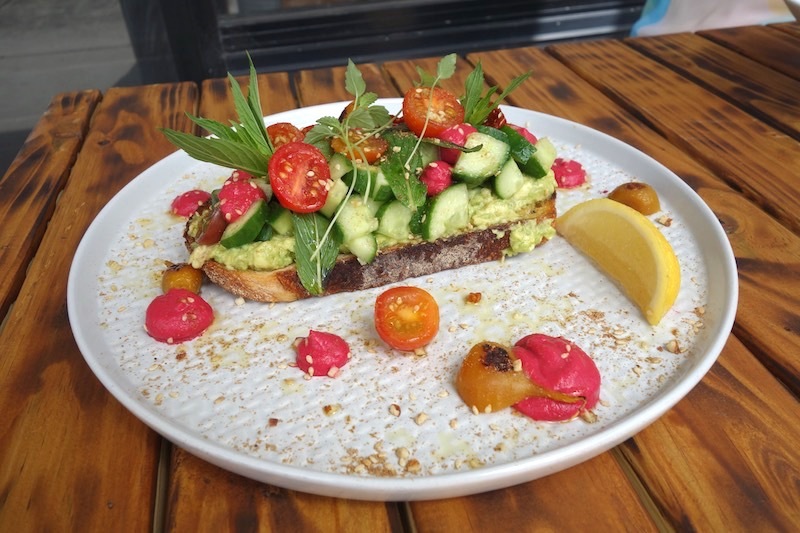 Where’s the Beet ($16) combines tried and tested avo and sourdough with a plump beetroot hummus and refreshing segments of glistening cucumber. Finish that with a poached egg ($4 extra). Taking to the alfresco setting later in the day? Opt for the exciting Sambousek Cigars ($20), blending beef mince and silvered almonds inside filo pastry; or the abundantly healthy sounding poke-bowl Pikachu’s Fest ($18). Contrasting the eastern suburbs venues that jostle and jibe on busy streets competing for diners, the relaxed and familiar atmosphere at Nelson’s Nest ensures that the venue’s focus is well and truly on pleasing customers. With an affordable and pleasantly customary, yet boundary pushing menu, the Annandale cafe proves that with simplicity comes satisfaction.